We help you to develop your career. We W3webschool Kolkata offer PHP training in Kolkata, one of the best online and offline PHP training to ensure a successful career in Web Development and IT industry. PHP training is one of the best ways for students as well as graduates who wish to build their career in IT. It is a server-side web scripting language. It is a widely used open source technology at the present time that most of the developers learn for a better hike in the career. PHP is used as web programming language around the world almost all small and medium organizations, and often some large organizations work on PHP technologies. PHP alongside MySQL database is widely used to build the robust database driven, dynamic as well as interactive websites. It is used to develop CMS (Content Management System) like WordPress Joomla and more, where PHP is essential to develop the platform. As the number of companies grows day-by-day the job vacancies in PHP technologies are increasing to fulfill this huge demand for countless fresher and experienced professional or PHP programmers. If you open the newspaper every day or surf the internet, you must see the PHP developers are regularly employed in small, medium and large enterprises. 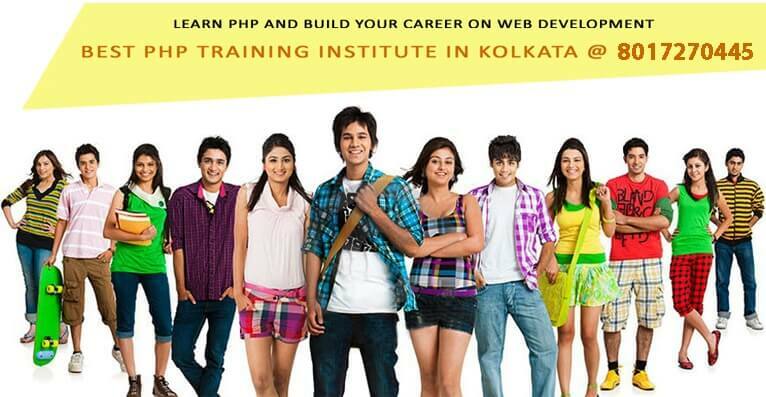 If you want to be the part of this journey we W3webschool PHP training Kolkata can help you. We are open to train all students and all backgrounds, fresher and experienced IT professional, web designer, graphic designer, SEO, and SMO specialist or others who are keenly interested to learn PHP and looking for a new career or boost their resume, or want to start working as a freelancer. Our PHP training in Kolkata consists from the fundamental to advanced PHP training, so that you can learn the very basics of website creation with HTML and step-by-step walk forward to the most advanced PHP in building the dynamic website. You can learn PHP, MySQL and AJAX technologies in a combined course, or you can learn the only PHP, as per your choice or need. Our PHP course is designed to cater the industry needs, due to the reason most of our students are placed in different IT industry not only in the city but also in other states in the country. We are also on a mission to train students with high standard PHP course, employability to keep in mind, providing an expert course at an affordable cost. Why You Choose W3 Web School? Today’s industry is looking for thousands of PHP developers who can take care of domestic and international projects, be they are fresher or experienced in IT. Bear in mind we have designed our training content to help fresher and experienced to get through the appropriate knowledge on how to create web application from the open scratch to the valuable production and also helps them to get hired by well-known IT companies in and outside of India. There are several reasons to choose W3webschool PHP Training, some of the reasons we have mentioned below. We are one of the most trusted PHP training institutes in Kolkata offers course at an affordable fee. We have designed our PHP course only to cater the industry need, so you only learn the working PHP that will help you to implement easily to become a successful developer. We provide an online and offline course, which hardly a few PHP training institutes in Kolkata offers. We provide digital and hardcopy course materials as per your choice. You can take your class according to your convenient time, no hard and fast rule. It is only your choice first. Flexible class and flexible learning, 100% learning guaranteed with job assured PHP training in Kolkata. Thinking for course fee? It is easy! Pay at a time with the lucrative discount or pay by installment, whatever you feel easy. Learning from top-notch faculties in industry, who are experienced with real life PHP issues and implementations, and most of them are B-Tech, BE, MBA (System), MCA from reputed engineering schools in India. You will have an opportunity to work on live project that will give you industry exposure to work and learn the core PHP. You will be more confident after completing the project work and live training, so you will get job easily. One and only PHP training institute in Kolkata – W3webschool has ever found. What should you know before PHP training? Why should you opt for PHP/MySQL training from us? Online PHP training is available – Anytime, Anywhere! Learn from industry leaders experienced PHP Expert. High standard courseware, printed and digital, professional PHP Course. You will learn step by step, from very basic to advance PHP course. All courses are designed on advanced PHP training. Affordable PHP training in Kolkata. Group Training to learn online training at low cost. Why will learning PHP help you? Money Back Guarantee: If you do not like our training, you can ask for 100% refund after your 1st live session or within 7 days. you can take 1 Hour demo class before admission call us for demo : 24×7 Hour Helpline 8017270445.